Oops, I thought I posted all the Block Party photos, except for one that I am saving for later. I forgot to mention all the great food. Here is a picture from the back of one of the restaurant booths. I think these folks are from Gadsden, AL. 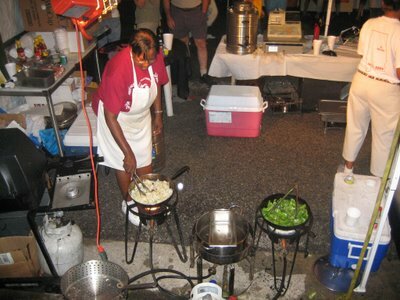 They are cooking onions and peppers on gas burners, and around front they sell sausage sandwiches. There was also pizza, barbecue, funnel cakes and lots to drink. I'm enjoying your pictures. My father always told me if the cows were lying down it meant it was going to rain!? I think maybe it just means they were tied of standing up! I'm jealous of your blackberries. We used to have lots of them on our street. We'd play a waiting game waiting for them to ripen and get out there before some of the other neighbors. We would have wonderful blackberry cobbler practically every night. Yum. Unfortunately, contractors discovered our quiet little neighborhood and now we have houses, lawns and driveways instead. Yes, the blackberries were better when I was a kid, too. Ah, food, it brings the people out and makes them happy!